Miss Chief, in the film “Group of Seven Inches,’’ is part of Kent Monkman’s “Théâtre de Cristal’’ at the Peabody Essex Museum. SALEM - Two of the most thrilling shows you are likely to see this year, both devoted to Native American art, are showing concurrently in New England. Both are filled with astounding and beautiful things. Both have been mounted at institutions that, boasting long relationships with Native American art, have collected it in depth. Both are underpinned by the expertise and personal voices of Native Americans. And both will take your imagination to places it may never have expected to go. The first, at the Peabody Essex Museum in Salem, is called “Shapeshifting: Transformations in Native American Art,’’ and will run until April 29. The second, at the Hood Museum of Art at Dartmouth College in Hanover, N.H., opened last year and runs until March 11. My best advice is: Make a weekend of them while they are both still on. For five more weeks, New Englanders have an unprecedented opportunity to see hundreds of amazing objects, from large-scale installations made in the past few years by brilliant artists who happen to be Native American, to traditional objects of bewitching beauty and palpable spiritual presence (totem poles, blankets, painted ceramics, woven baskets, bandolier bags, and so on) as well as numberless things, neither traditional nor contemporary, whose existence you might never have guessed at. It’s impossible to rank one show higher than the other. “Shapeshifting,’’ at Peabody Essex, is perhaps more beautifully presented. It’s also slightly more ambitious in its mix of contemporary and traditional art. But there is something particularly moving about the presentation at Dartmouth College, which, though it was founded with the education of Native Americans in mind, has a long history of betrayal and disappointment for which it has been trying, for several decades, to make amends. This show is part of that effort; it transcends its own good intentions. The Hood show is drawn entirely from its permanent collection. Remarkably, most of the objects are on public view for the first time. Although the show is divided up according to art-producing regions (Arctic, Northwest Coast, Plains, Woodlands, and so on), it mixes modern and contemporary work with older objects. 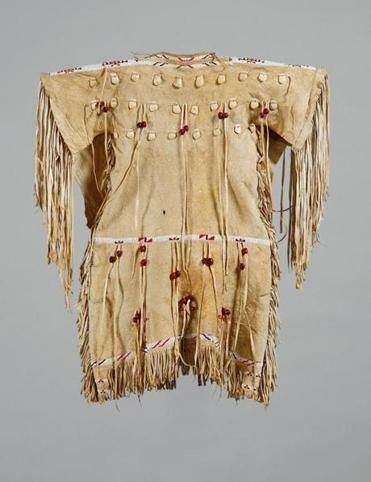 So, for instance, you might see a girl’s traditional fringed dress made from tanned hide, glass beads, bones, string, sinew, and thread within view of a contemporary digital photograph by Rebecca Belmore, which shows the bare back of a reclining woman (Belmore is one of several artists who appear in both shows). That back is traversed, troublingly, by a long scar from which a fringe of red strings descend, like rivulets of blood. The connections between the two pieces, and many more nearby, do not need spelling out. The Peabody Essex show takes a similar approach, mingling contemporary and traditional work. But it eschews geographical categories and organizes itself by theme instead. These themes - Changing, Locating, Voicing, Knowing - have a vague, catchall quality. But they do their job, which is to get us thinking in new ways about a category of art that has long been subject to sentimental, limiting, and downright patronizing ideas. What is Native American art? How long have you got? The category’s central paradox - and it’s a bitter one - is that a people whose diverse cultures were subject to centuries of systematic, government-sanctioned destruction over several centuries are now, in the field of culture, expected to conform to definitions of “authenticity’’ that are, for the most part, impossible to meet. Those definitions can be legal. One thinks, for instance, of the requirement - designed to protect the market for Native American art from false labeling by others - in the 1990 Indian Arts and Crafts Act that only citizens of government-recognized tribes may market their art works as “Indian-produced,’’ a requirement that in turn demands proof of “blood quantum’’ or degree of Indian ancestry. Much of the work in both shows addresses all the ironies - by turns toe-curling, humorous, and flat-out depressing - inherent in this situation. There is, for instance, Kent Monkman’s installation, “Théâtre de Cristal’’ (the first work you see in “Shapeshifting’’), which, beneath a giant chandelier echoing the shape of a tepee, projects onto a buffalo hide rug two short, satirical films. One of them, “Group of Seven Inches,’’ shows a transgender Native American called Miss Chief luring two white males back to her cabin, getting them drunk, and employing them as figure models. Conceptually, the work - an inversion of things that happened (more or less) to Native Americans who were treated as “specimens’’ by both scientists and artists - may be a bit elaborate. But as theater, it’s effective, and it gets the show off to a spectacular start. Even better, further in, is a two-part video piece by Nicholas Galanin. The first part shows Galanin break dancing to a traditional tribal song. The second shows a Tlingit dancer in traditional garb moving to the sounds of electro-bass rap. Of course, cultural schizophrenia - more politely described as cultural exchange - is hardly a recent phenomenon. The objects in “Shapeshifting’’ attest to its long and often enlivening history in all sorts of ways. There is, for instance, a stunning cape made some time in the 1820s by an Unangan artist from Alaska. Capacious and rainproof, it is made from traditional materials: mammal intestines and esophagus. But it’s cut in a Western style, since it was intended for sale to members of Russia’s military or to visiting Europeans or Americans. Consider, too, a tabernacle with candlesticks made in 1840 by an Odawa artist from Cross Village on the northeastern shore of Lake Michigan. This astonishing work combines Christian forms and beliefs with neoclassical aesthetics, floral patterning from Western sources, but also tribal geometric motifs and such traditional materials as porcupine quills, birchbark, fiber, and wood. The result is an elaborate fantasia that is not only beautiful, but about as historically and aesthetically loaded as an object can get. Lacking purity and authenticity makes most of the objects in both these shows all the more alive, beautiful, articulate, and surprising. I have barely scratched the surface of all that they have to offer.